Baracuda G3 ONLY $399.99 +Tax - Local Delivery Only! 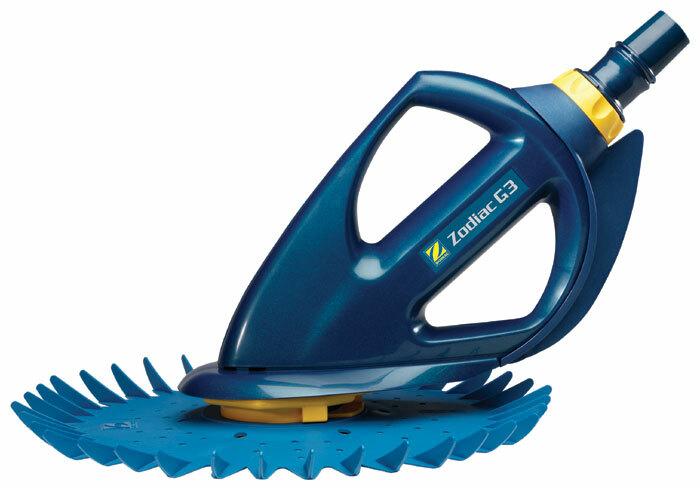 The Baracuda G3 from Zodiac cleaner will thoroughly clean your in ground pool floor and walls to automatically remove dirt, debris, bugs, twigs, leaves, sand and even pebbles. Its bumper fin anti-stick design ensures that it will reach your entire pool because it navigates around steps, ladders, and corners ensuring maximum coverage and increased maneuverability. It is one of the most pool-owner-friendly cleaners ever made. The Long-Life Diaphragm is the only operational moving part, with no gears, wheels, or flappers it ensures quiet, simple operation and low-cost maintenance. If it should ever need service, its patented Quick Release Cassette has easy access to the diaphragm letting you remove it, replace it, or service it yourself poolside. The Baracuda G3 also has the Flowkeeper; a compact self-adjusting flow control valve that automatically regulates water flow, ensuring peak performance even with lower horsepower pumps. Plus, Flowkeeper offers pool surface skimming with a turn of a switch and cleans when your pump runs. The unit hooks up to your skimmer and is driven by your pump and filter system. It is pre-assembled, requiring no tools or special plumbing to install, operate or maintain. The Baracuda G3 includes 39-feet of hose and a 2-year limited warranty against manufacturing defects and wear and tear. Delivery to Auburndale, Lakeland, Winter Haven and Surrounding areas Only. Your order will arrive in 7-10 days.